It is uniformly accepted that transfer pricing in India is becoming more and more complex. The tax authorities there often take stands on transfer pricing treatment, especially of marketing intangibles, that are diverse and aggressive, compared to jurisdictions in other parts of Asia and the rest of the world. 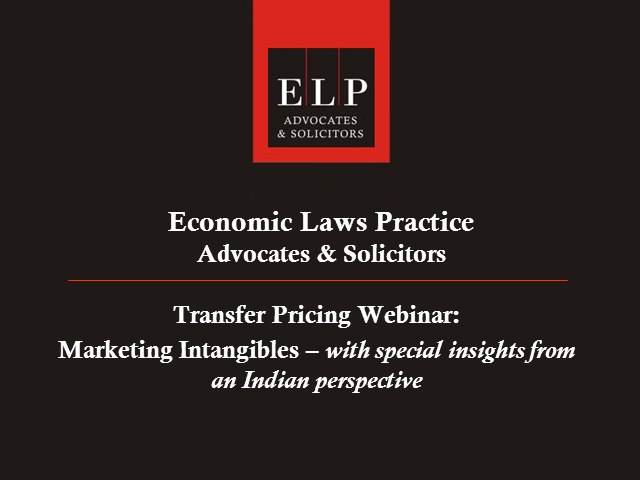 In this webinar, experts from Economic Laws Practice and their guests from international law and consulting firms in the US, UK and the Netherlands will discuss some of the recent judicial rulings on marketing intangibles in India and best practice approaches that can be adopted by taxpayers. Join editor Jon Moore for this exclusive webinar to learn more about the research process for World Tax and World Transfer Pricing 2020. 1. Preview of the 2020 questionnaire. From the April 1 2019, more than 2 million UK VAT registered businesses will face demanding new obligations from HMRC on their VAT recording and filing. This will mean that all businesses will need to upgrade to existing accounting/ERP software that is adapted for the new filing regime. Join us for an informative webinar, where our speakers will outline some of the recent developments as well as how Avalara can help ensure you are compliant with our MTD Filer software - a free Excel add-in which has an inbuilt API into HMRC's portal. •An end-to-end demonstration of MTD Filer. Richard Asquith is the VP of global indirect tax at Avalara, a global transactional tax technology company. He leads Avalara’s outsourced international VAT compliance service. Richard originally qualified at KPMG in the UK, and then spent more than ten years with EY in Hungary, Russia and France. India’s annual budget is one of the most keenly awaited economic events in India. This year’s budget is the last full budget to be presented before general elections are held in mid-2019. Join International Tax Review, Dhruva Advisors and Taxsutra as we discuss the implications of the tax proposals. •Broadcast live at 11.30am GMT/5pm IST on Thursday, February 1 2018. This will be followed by a Q&A session. Recent studies show that the African continent is attracting a growing amount of investments from foreign multinational enterprises. BonelliErede and International Tax Review will provide an overview of the main transfer pricing issues to consider for structuring investments into selected countries. The finance minister of India, Mr. Arun Jaitley, will be presenting India Union Budget 2017-18 on 1st February. International Tax Review along with Dhruva Advisors LLP is pleased to invite you to a webinar where the implication and impact of the direct and indirect tax proposals in the budget will be discussed. Looking at the importance of efficiently managing your global transfer pricing documentation requirements, we will look at the different types of documentation such as master file/local file and country-by-country and look at managing the requirements in practice. TMF Group's Global Head of Compliance and Strategic Regulatory Services, Leila Szwarc will welcome guest speakers from DLA Piper who will look in depth at select countries including the Netherlands, Spain, Germany and Hong Kong sharing information on a few key deadlines. We will find out this Monday, when he presents the Union Budget for the year 2016-2017, if the Indian finance minister will unveil some big bang measures on the economic and tax front to provide much needed impetus to Indian growth story or whether the government’s incremental approach will continue. Dhruva Advisors LLP is partnering with International Tax Review to present a webinar on the day of the Indian Budget 2016-17, where our experts will discuss the budget proposals and analyse its key implications. ITR introduce TMF Group's Global Head of Capital Markets & SPV, Jeroen van Zanten and guest speakers, Joel Cooper and Randall Fox of DLA Piper, to elaborate on the most recent developments, on a global scale, of country-by-country reporting requirements; taking the opportunity to share a deeper insight into the specific requirements laid out for highly-impacted jurisdictions. Managing VAT and excise tax in the current environment is time consuming, costly, and subject to frequently changing mandates. Recent Aberdeen Group research uncovered key strategies that top performing organisations utilize to ensure compliant processes and accurate reports at a lower cost. Learn secrets of leaders that make tax calculation and returns look easy. The Indian Budget 2015 will be the first opportunity for Prime Minister Narendra Modi and his government to set out in detail how it hopes to create more tax-friendly conditions for investors. Many questions need clarification: Will the GAAR start on schedule? What favourable changes can be made to the direct tax regime to encourage investment? What are the implementation plans for GST and when are they likely to happen? Let Dhruva Advisors and DhruvaVox take you through the main points of the announcement and help you find the answers to these and other issues. With ever increasing pressures to seek efficiencies in day-to-day processes and increase time for planning and analysis, tax is looking to automate with tax technology. Imperial Tobacco worked with Longview Tax to implement a global data consolidation and reporting solution many years ago and continue to use it today. Learn about the technology, the implementation and the best practices for designing and implementing a solution. In the light of the announcements such as the Shome recommendations on GAAR, indirect transfers for bringing stability to taxation and an increased need for fiscal consolidation, expectations are high that the upcoming budget will be a positive, but responsible budget with fair and stable provisions. To find out whether India continues to be an attractive investment jurisdiction and how the provisions may impact global investors, join our expert panellists Rajendra Nayak and Heetesh Veera, Tax Partners Ernst & Young for this web seminar on budget day . •The rapidly expanding global shale/tight oil and shale gas play and highlight some of the transfer pricing issues inherent in these cross-border investments of oil companies. •Transfer pricing considerations of intragroup financing that highlights the challenges of pricing cross-border loans in this capital intensive industry. Given the complexity and variety of tax issues within this industry, this presentation should be the starting point rather than the finish line for all of your O&G Industry transfer pricing inquiries. While many multinational corporations (MNCs) have informed, well-supported transfer pricing policies and tax compliance documentation, they are often challenged with the day-to-day financial implementation of their transfer pricing policy. Failure to properly address this challenge can result in large year-end adjustments, process inefficiencies and increased tax costs. With increased scrutiny and tighter transfer pricing regulations expected in 2013, how can MNCs efficiently manage their day-to-day transfer pricing implementation, increase pricing transparency, and ensure accounting integrity for their intercompany pricing year round? What if the unthinkable happened and one or more countries left the Eurozone? Join us as we trace the footsteps of three hypothetical multinationals, who illustrate very different attitudes toward Euro exit contingency planning and are in different states of 'preparedness.' We will examine the potential impact on their supply chains, financial and legal structure and resulting tax consequences. By comparing and contrasting their experiences, we expect to learn some key lessons and actions tax directors could undertake now to avoid expensive tax mistakes in the future. Our moderator, David Gill, will chair the discussion between a panel of Ernst & Young professionals. Helmar Klink and Spyros Kaminaris will look at international tax implications; Craig Mitchell will focus on the supply chain; Mark Minihane will examine the treasury implications, and Cornelius Grossman will look at the legal perspective. A proactive approach to managing global transfer pricing disputes can enhance both efficiency and effectiveness. Many countries are therefore adopting advance pricing agreements (APA) programs as a way of addressing evolving transfer pricing issues worldwide — as of July 2012, more than 30 countries allow APAs. One jurisdiction with the highest rate of transfer pricing litigation activity is India, where a high proportion of taxpayers rely on litigation for resolution of disputes. One obvious reason for this could be the absence of an APA program in India under the current tax law. Realising the severity of the issue, an APA program has been implemented through the last budget amendments. The Finance Bill 2012 reinvented the law on service tax by introducing the concept of Negative List Taxation. This proposed amendment, will have a deep impact on service transactions. The concept will cover all services (unless specifically excluded), thereby making most service providers liable to service tax. This new scheme has thrown up a range of new issues, which every business (whether a manufacturer, a service provider or a trader) will need to deal with. And the introduction of the Negative List, before the introduction of GST, leads to significant gaps in relation to generation and use of tax credits. This anomaly will, doubtless, add to the real indirect tax cost of transactions in India. This webinar is aimed at familiarising taxpayers with the new scheme and to highlight various issues and potential challenges that companies may face the future.